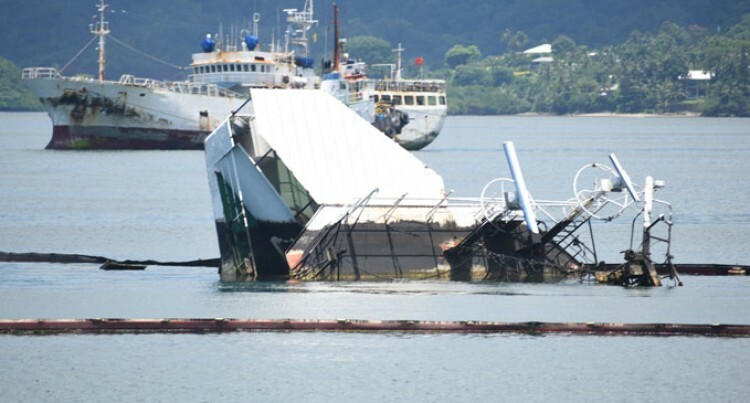 Sunken Southern Phoenix at Suva Harbour on January 25, 2018 Photo: Vilimoni Vaganalau. The immediate removal of the Southern Phoenix is a priority of the Fiji Ports Corporation Limited (FPCL). Fiji Ports Corporation Limited chief executive officer Vajira Piyasena said they were working closely with the owners of the sunken vessel, Cruz Holdings Limited. “Pacific Towing (PNG) Limited and Perrot Salvage Pty Limited Australia have been identified to carry out the work with assessment already conducted for her removal,” Mr Piyasena said. “The removal of the Southern Phoenix is the responsibility of the vessel owner Cruz Holdings,” he said. Attempts to get comments from Cruz Holdings Limited Manager Victor Fatiaki before this edition went to press were unsuccessful. Absorption pads have circled the wreck as a precaution in case of an oil spill since it sunk on May 6 last year.